Our post today highlights our mission statement of teaching, research and service that we are so proud of. Drs. Redig and Ponder are currently at the European Association of Avian Veterinarians Conference in Wiesbaden, Germany. They co-taught an advanced avian orthopedics laboratory. Dr. Ponder was able to send a photo of Dr. Redig working with conference attendees. Xcel Energy has several peregrine falcon nest boxes with cameras on their plant smokestacks. 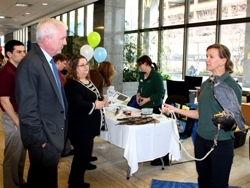 In this photo, volunteer Sally McRoberts and Artemis the peregrine falcon speak to Xcel Energy CEO Ben Fowke.